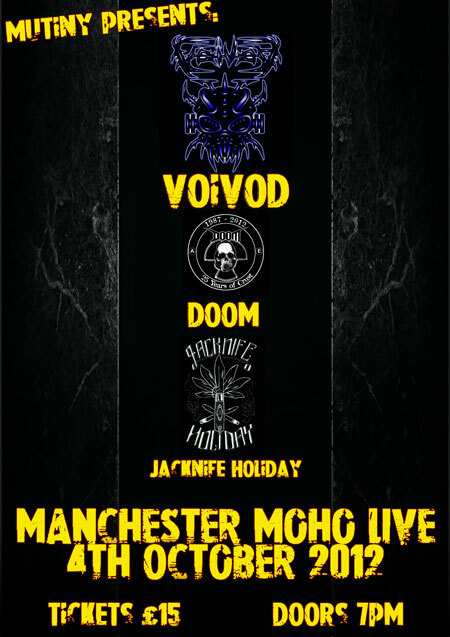 Manchester’s Mutiny Events play host to prog metal legends VOIVOD this Thursday at NQ Live (formerly Moho Live) and if one legend on the night wasn’t enough, main support for the night comes from crust legends DOOM and opening the night are local sludge deviants JACKNIFE HOLIDAY. Tickets are still available and are priced at £15 on the door, on the night and it all kicks off at 7.00pm. In other JACKNIFE HOLIDAY news, they are just putting the finishing touches to their, as yet untitled, second EP, due to be mastered by Dennis Plecker of BONGRIPPER, and out before the end of the year.